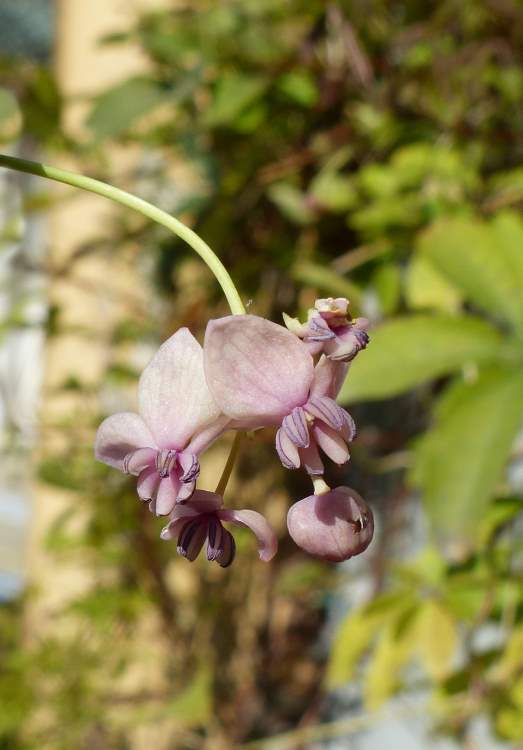 Akebia quinata. Photo by Enrico Romani. luirig.altervista.org (Accessed 7/24/2017). 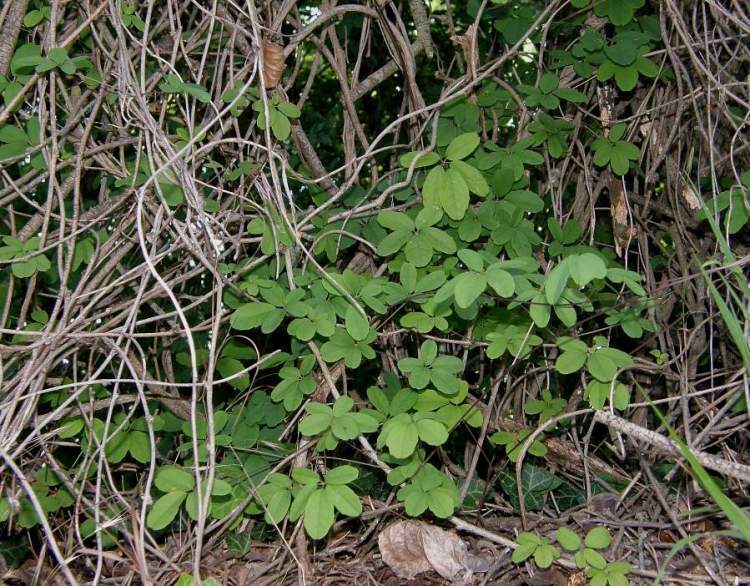 Akebia quinata is a twining woody vine to 12 m or more, sometimes growing as a ground cover, stem slender, new growth green, bark becoming grayish with numerous small, raised lenticels, rooting at nodes when in contact with ground. Leaves alternate, stalk 2-12 cm long, blade palmately compound, leaflets 5, stalks 0.2-2.2 cm long, blades 1-8 cm long, 0.4-4 cm wide, oblong to elliptic, tip notched, base rounded, dull bluish green above, whitish below. Flowers purplish-brown, monoecious (flowers of separate sexes on same plant), 3-parted, radially symmetrical, fragrant, no petals, sepals petal-like, free, male flowers 1.2-1.6 cm wide, sepals 0.5-0.9 cm long, oblong, stamens 6, 0.5 cm long; inflorescences of 4-15 flowers in drooping clusters; female flowers 2-3 cm wide, sepals 1-1.6 cm long, elliptic, pistils 8; inflorescence of 1-5 flowers in drooping clusters; blooms March-April. Fruit purple, fleshy, sausage-shaped pod, 5-15 cm long; splitting open to reveal numerous black seeds in whitish pulp, rarely produced (Flora of North America 1993+); fruit matures Sept.-Oct. (Dirr 1990). Habitat: Escaped from cultivation, locally, or spreading at old garden sites. Notes: Listed as invasive in several states including New Jersey (Swearingen 2007).